TUMBLER ALERT: Be wary about buying these tumblers cheap on sites like eBay and the large car part sellers. Many have manufacturing flaws that are not easy to detect until you install it and then can not turn the key or get it back out. Kent addesses this issue is his video and even offers an emergency release tool should this happen to you. Many of those cheap tumblers come without a bit of lubrication inside the mechanism. We take each tumbler back to our shop, test it thoroughly in an steering lock assembly for proper fit, modify the lock in mechanism to make the tumbler easier to install and remove, and finally lube each one with a curved tip syringe and special long lasting synthetic grease. What other seller is willing to do that? We have seen so many problems with some of the aftermarket tumblers that we won't sell them unless they go through our rigorous inspection and lubing procedure. APPLICATION: This two keyed ignition tumbler assembly fits all 201 190E and 190D from 1984 to 1993 and all 124 chassis 260E 300E 300CE 300D 300TD 300TE 400E 500E E300 E320 E420 and E500 from 1986 to 1995. 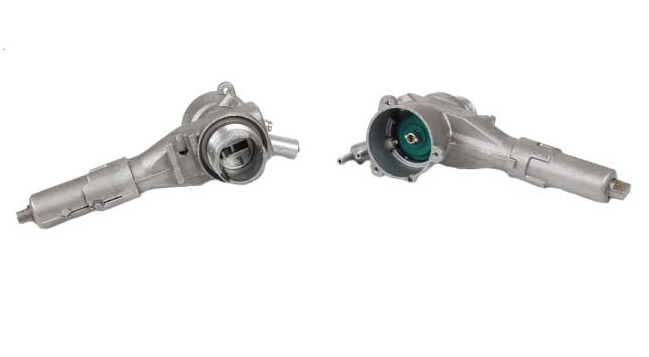 It also works on the 1990 and 1991 126 300SE 300SEL 350SD 350SDL 420SEL 560SEL and 560SEC (ONLY 1990 and 1991 126 models with transmission lock out cable (foot must be on brake to move transmission selector). The ignition tumbler assembly is easy to remove and replace as long as you have a good key and can turn on your switch with it. This is the main reason we strongly urge our customers to change the tumbler assembly at the first sign it starts to stick or jam. A new tumbler and key is cheap. But, if you wait too long, then you can get stranded somewhere not being able to start your engine. You may have to pay for a tow to a shop. Then replacement can become a huge hassle and very expensive, often costing $500 to $1000 in a shop. If you do it yourself, you may still have to buy a complete new lock assembly as well as a new tumbler and key. A word to the wise. 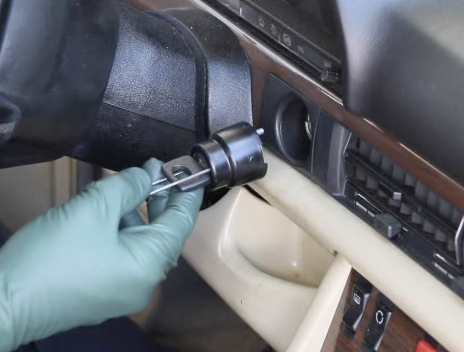 Don’t wait to fix a sticking or hard to turn ignition key! Replacing the tumbler is not difficult if you have the right tools and know how. You can actually do it sitting in the car in less than 10 minutes. If you are not familiar with how to do this or you do not have the right special tools, then we highly recommend you buy the installation and lubing tool kit. This comes with free 26 minute videos instructions going over the theory of operation, the problems you might face and how to do the job right. Without the special tool and instructions on how to properly a tumbler, the job can be very frustrating. The forums can even be misleading and sometimes give you the wrong or incomplete inforamtion. Keep in mind the new keys will not match your door locks, so you will need to continue to use your old key for that purpose. The picture below shows the new tumbler being installed in a 1990 300SE. If you key is stuck and will not turn, the removal procedure is outlined in Kent's manual as shown below. Covers most models from 1968 to 1995 - See list of applicable chassis in the description. For all 107 108 109 114 115 116 123 126 201 and 124 Chassis 1968 to 1995 including those models that have a special cable installed to keep the transmission locked until the key was turned. For all 108 109 114 115 107 116 123 126 201 and 124 Chassis 1968 to 1995 including those models that have a special cable installed to keep the transmission locked until the key was turned. May this never happen to you! It can become a real big wrench dance. Jammed up steering locks and keys that won't turn can leave you stranded. 1990 to 1995 201 126 and 124 Chassis Ignition Lock and Key Assembly - ASSEMBLED! If your key is starting to stick in the ignition pay attention! Better to replace the part before the key gets stuck leaving you stranded. Because of the lock out feature in these cars, if you can not turn the key on - you can not even move the car off the road. What is that Left-Over Part After I installed a New Ignition Tumbler? Can You Start an Older Mercedes without a Key?